Part of the reason psoriasis is so complicated is that it can show up in the many different forms, and each form affects people differently. What's more is that you can have just one type of psoriasis or you can have several types of psoriasis simultaneously, and what you have now may change completely next year. But your dermatologist must determine which types you have since medications vary depending on the kind of psoriasis. Plaque psoriasis is the most common type of psoriasis, affecting approximately 5 million Americans. It's characterized by patches of dry, itchy skin. In fact, 90 percent of all psoriasis is plaque psoriasis. This uncomfortable condition is slightly more common in men. The plaques tend to get bigger until they reach a certain size, then they may not change for months or years. 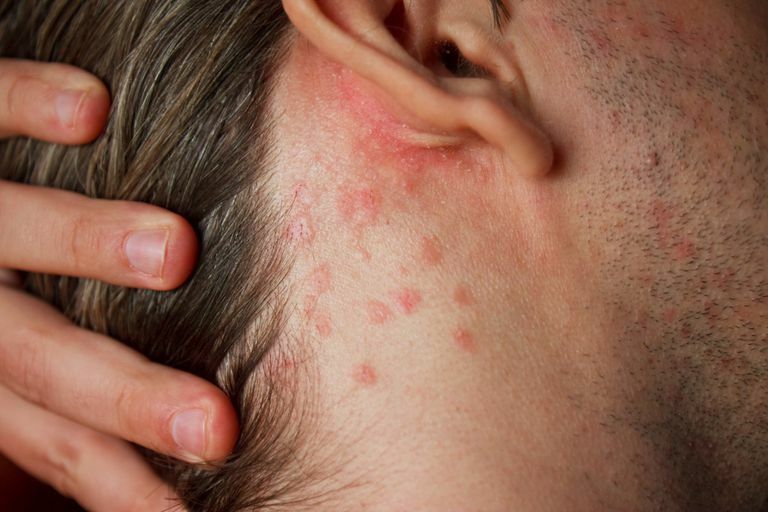 The scalp is the most common place for people with psoriasis to get a rash. Some people might only have a small patch with slight scaling, usually on the back of the head or upper neck. Other people might have a raised, reddish rash that covers their whole scalp. Many individuals with scalp psoriasis mistakenly believe they have seborrheic dermatitis instead. While the former condition usually looks powdery and casts a silvery-looking sheen, the latter typically appears oily and yellowish. The nails are often affected by psoriasis. In fact, 80 to 90 percent of people with psoriasis will have nail changes at some point in their lives. The fingernails are more often affected than the toenails. Psoriasis can affect all aspects of the nail causing various abnormalities, including pitting of the nail and thickening caused by fungal infection. The condition may also cause the nail to be misshaped. This condition can be difficult to treat. Inverse psoriasis, also referred to as intertriginous psoriasis, is an unusual type of psoriasis that occurs in skin folds located in the armpits, beneath the breasts, near the pelvis or in other skin folds. This can make inverse psoriasis look like other skin conditions. This form of psoriasis typically produces smooth, red lesions. Guttate psoriasis is a common form of psoriasis in children, but it is seen in fewer than 2 percent of psoriasis patients. It often occurs one to three weeks after a viral or bacterial (often streptococcus) respiratory infection. It is characterized by pink droplets (1 to 10 mm in diameter) on the skin covered by fine scales. The word "guttate" comes from the Latin word for drop, "gutta." Pustular psoriasis (also known as von Zumbusch psoriasis) is a rare, sometimes fatal form of psoriasis. It is characterized by pus-filled blisters and red skin. It often appears on the hands and feet of adults. Despite its appearance, it is not contagious. People with this form of psoriasis often experience fever, chills, dehydration, increased heart rate and other serious symptoms. They frequently require hospitalization as a result. Habif, Thomas. "Psoriasis." Clinical Dermatology, 4th Edition. Ed. Thomas Habif, MD. New York: Mosby, 2004. 209-39. Iizuka, Hajime, et al. "Pathophysiology of generalized pustular psoriasis." Archives of Dermatologic Research 295(2003): s55-9. Schon, Michael, and W.-Henning Boehncke. "Psoriasis." The New England Journal of Medicine 352(2005): 1899-912.